A @Nachos_Grande group break delivered the goods. 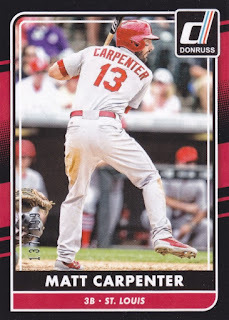 Literal Fan of Reds, and known Cardinals-hater Chris from Nachos Grande hosted another super group break a couple of months ago, and I was a happy participant. 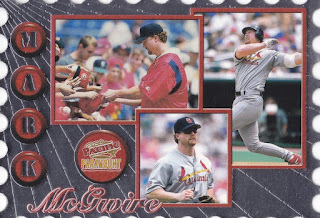 I'm always interested in the breaks that favor team collectors instead of hit-chasers, and this one had a nice variety of stuff from the '90s and '00s. 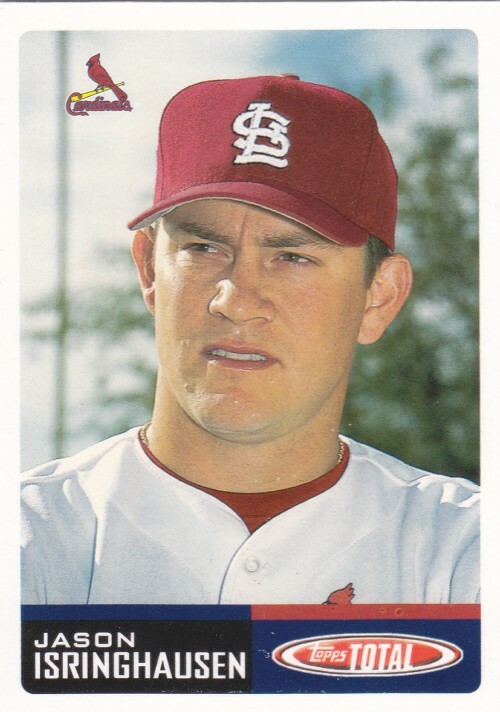 Here's a head shot of Izzy, brand new to the Cardinals at the time. This was one of a handful of 2002 Topps Total cards I needed from the break. 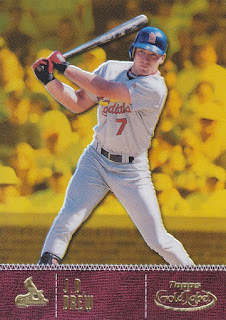 One of the biggest attractions to the break was the ultra shiny and suave 2001 Topps Gold Label. This is a Gold version of J.D. Drew's Class 2 card, numbered to 699. 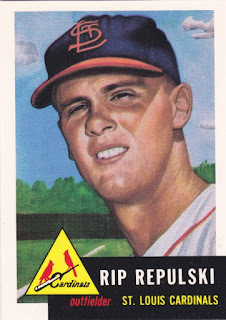 Someday, I will have all of the shiny things and variations and retire as the King of Baseball Card Mountain. 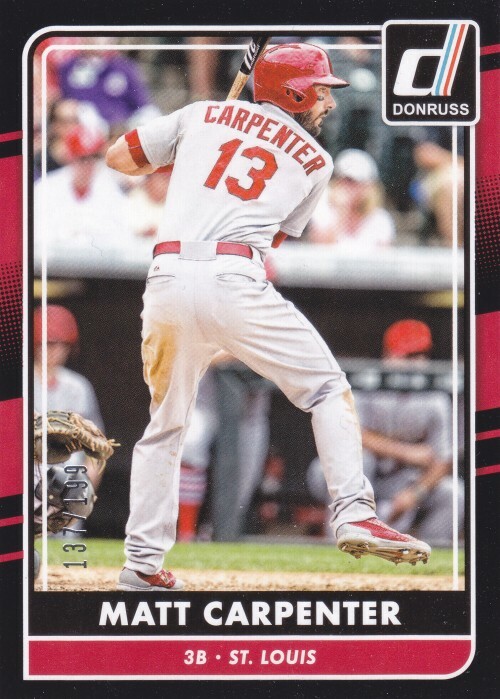 Here's another numbered card, from 2016 Panini Donruss, which I believe was a bonus to the break. 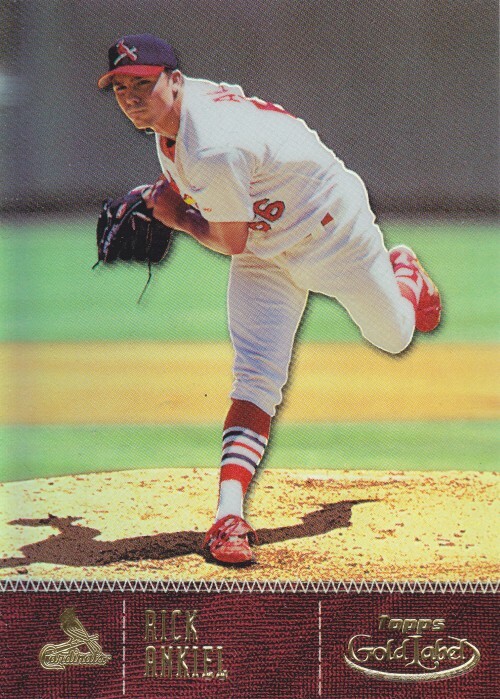 These Black parallel cards look good when contrasted with Cardinal red. 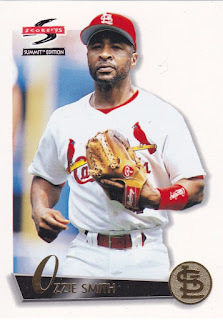 I am pretty much up for any break that includes Pacific products, because I don't have a lot of their stuff and they always seem to have a million parallels, something that seems to have rubbed off on Panini when they inherited their rights. 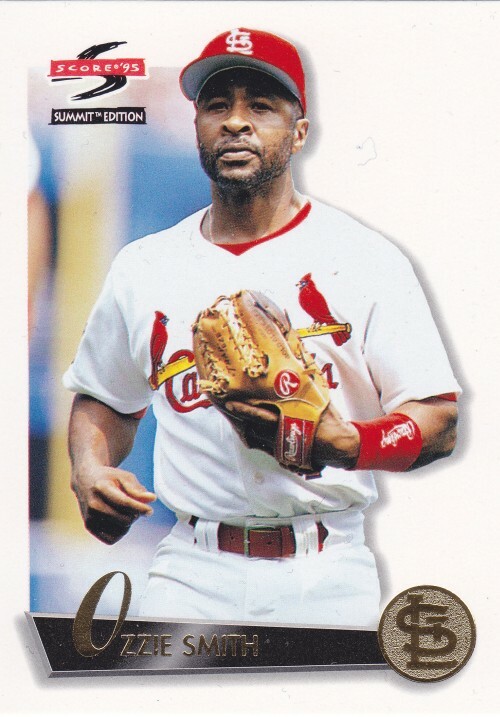 In a mild upset, there was actually an Ozzie Smith base card that I needed. 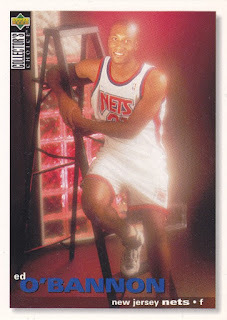 This is from 1995's Score Summit set. It's pretty Score/Pinnacle looking, but the thickness of the cards adds a nice touch. Back when I was actually still collecting, Topps issued a full reprint set, under the now ubiquitous Topps Archives name, of 1953 Topps. I must have completely ignored it, because I was generally uninterested in anything older than I was at that particular time in my life. Ah, youth. In any case, it was nice to pick up a bunch of cards from this set. Finally, here's a collecting dilemma, although I'm not really going to lose any sleep over this one. 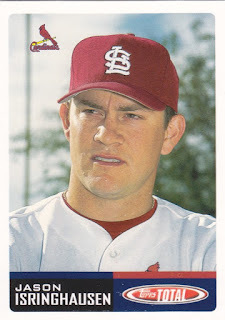 I pretty much add anything Cardinals related to my collection, but I might have to draw the line at this one. 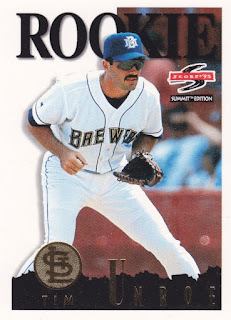 As you may know, a number of the cards in the 1995 Summit set have the wrong logo foil stamped on the front of the card. (I have a Terry "Not The Famous Quarterback" Bradshaw card with a Brewers logo stamped on it in my collection, for instance, even though he never belonged to that team.) 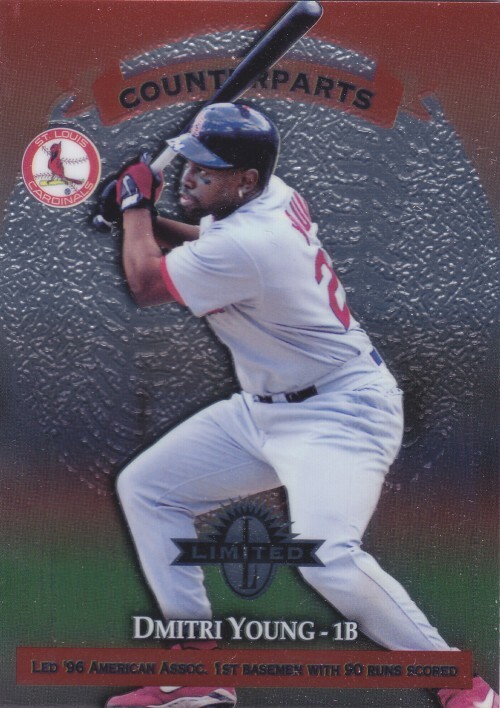 Mr. Unroe, if that is his real name, was never a part of the Cardinals in any capacity, so it's hard for me to consider including this in my collection. I also had the Baltimore Orioles in this break, so if you are a fan of that team and have some needs from any of the sets shown here, feel free to let me know! A numbered Brian Roberts card may be in the offing for you. That postage stamp like card from Pacific was pretty cool to pull. I had never seen that design before (part of why I love including Pacific stuff in my Retro group breaks)! Great looking Ozzie card. Thanks for sharing. I'm not familiar with the majority of these sets. Looks like a fun break. Pacific did some great die cuts, but my scanner hates them too.